Great Britain! The land that birthed so many legends, from King Arthur to the Loch Ness Monster. For a relatively small island country, Great Britain is steeped with history and folklore handed down through the generations. The people that inhabit the fair country are very diverse while sharing a common history. For hundreds of years Great Britain also was the epicenter of science and technology and gave rise to the Industrial Revolution. Names like Isaac Newton, Michael Faraday, Francis Bacon, Robert Boyle, Charles Darwin, and Stephen Hawking are just a small list of the many brilliant minds to emerge from the cold, wet British winters. There are other names that might not be as familiar to the average history buff, though they are giants in the field of horology: John Harrison, Thomas Tompion, George Daniels. All are considered geniuses in their own right and all made immense contributions to the art and science of watchmaking in Great Britain and worldwide. Daniels (1926 – 2011) is the only one to have been active recently; the others made their marks over two hundred years ago. So with that fact bubbling around your brain, you might assume that British watchmaking is actually a remnant of the past; long relegated to mechanical curiosity instead of serious horological production. But, just like the legends of old Loch Ness, horological knowhow been passed down to the next generation. Luckily, it was also passed down by none other than the great George Daniels, and its recipient has morphed from student to master. 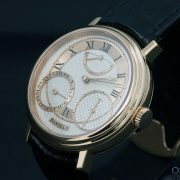 I am talking about the esteemed Roger W. Smith, Daniels’s only apprentice and current virtuoso of British watchmaking. Smith is carrying on Daniels’s legacy of handmade British watches in his studio on the Isle of Man. Having been taught by this century’s premier watchmaker, Smith feels obligated to adhere strictly to the goal set forth by his teacher: to make high-quality, handmade watches in traditional English style. One watch at a time. To do this, Smith had to learn the 32 trades specific to watchmaking that Daniels had mastered a half-century ago. These skills have made him a legend as well, being one of a very few people who can build a complete watch from start to finish, dial to screws. I simply went gaga over R.W. Smith’s latest creation when I first saw it. Commissioned as part of the British government’s GREAT Britain campaign, which is on its third year, Smith’s latest creation is appropriately called the GREAT Britain watch. Well, of course! This watch is truly stunning, and is an amazing testament to the skill of Smith and the old-world craft that he is sort of an ambassador for. This timepiece is now an official ambassador to Great Britain and will make its way around the world to showcase the skill and beauty that can exist in British products. This piece is definitely at the top of those products, but I would think Smith is extremely proud to have his work speaking on behalf of the entire nation. But the facts of this watch are where it’s at. Let’s start with the dial. *Sigh*… such a beautiful piece of guilloche and one of the most complex handmade dials I have seen. The base dial is composed of three different patterned layers of Sterling silver, all intricately (and separately) engraved on a rose engine and then soldered together. On top of that, they aren’t just pretty, but a perfect representation of the Union Jack. Whoa. Moving beyond that amazing base dial, you have perfectly hand-cut Roman numeral markers, blued to the standard purplish-blue that is now synonymous with Smith. These accompany two Sterling silver chapter rings and a pair of hand-engraved plaques bearing the name of the maker and the title of the watch, which should both be obvious at this point. Telling the time are the perfectly shaped and also purplish-blued, scalloped hands that Smith puts on all of his pieces. All of these elements combine to make a very interesting dial from a design standpoint, but also a brilliant showcase of many individual crafts that Smith has mastered in his more than 25 years as a watchmaker. The case is a masterpiece of old-school techniques as well. It starts as three strips of platinum that are rolled to size, bent in a circle, and then soldered together. At this point they are pressed into a round form, which makes them perfect circles and ready for machining. This is very different from the way most companies make cases today, which is either from a block of material that is turned and machined or from a slab that is pressed into rough shape and then machined. This technique is simply amazing to understand, and even more amazing to realize that is how MANY cases were made for the better part of two centuries. Who am I kidding though; my heart still belongs to that movement, that oh-so-beautiful, handmade, British, three-quarter plate movement. Based on Smith’s Series 2 movement, the architecture has been redesigned to exhibit traditional British watchmaking even more clearly, and the choice was a good one. A raised barrel bridge stands on pillars like the pocket watches of old and is ornately engraved with a floral motif – the makers mark – and the Isle of Man triskelion symbol. Blued screws and red gold chatons complete the bridge and mark this movement as the utmost in quality. The balance bridge – also engraved – holds a handmade, free-sprung balance wheel with counterweights sitting above the biggest element of Daniels legacy that appears in this watch. The Co-Axial escapement is Daniels’s pride and joy. For he loved it so much, he gave it to the world (or to be more precise, to Omega) and now we are blessed to live on a planet where there is an escapement that has almost no friction, needs little in the way of lubrication, and is extremely accurate, as much or more than the long-championed Swiss lever escapement. Smith was the perfect apprentice for Daniels, as he has taken the Co-Axial escapement and improved upon it even more by making it out of one piece and reducing the weight by more than 23 percent. This allows for much faster acceleration and much less abrupt deceleration, making this escapement an engineering feat and a legend all by its lonesome. And what would a R.W. Smith watch be without superb finishing? Well, it would still be an amazing watch, but it would not bear the seal of Smith or leave his shops. Good news for us that this is not one of those pieces. No, no, this piece is finished to traditional British standards, albeit the highest of those standards. Gilt and frosted plates, polished screws and pins, brushed edges, hand-beveled steel components; all of the parts from the leaves of the pinions to the lugs on the case are dang near perfect. Every component is addressed and finished with the same rigor so that not one spec of his watch fails to live up to the standards that his teacher held himself to. That is a legacy to be proud of. Sadly, this watch may never grace my wrist or many others’ as it is a unique piece, on loan to the GREAT Britain campaign, and highly coveted by any and all collectors of haute horology. But that fact does not keep me from dreaming about it at night or lusting after it during the day. I am simply happy it was created: for my eyes, for my passions, and for the things it teaches me about striving to be the best and appreciating skills that have come before you. Luckily, Daniels saw fit to pass on his legacy to Smith and as a result we are blessed to view such creations by these giants among men. Looking at things like this almost causes me to have a mental breakdown. But instead I will just give you my breakdown of the piece! • Wowza Factor * 10 Seriously, did you expect anything less from R.W. Smith? I didn’t think so. • Late Night Lust Appeal * 214gn » 2098.623m/s2 Watches don’t get to this level easily, as it is the most a human has ever survived. This watch pushes me to that limit! • M.G.R. * 68.5 Super strong showing, completely handmade will get you that. Now if it could have some extra functions for even more horology-nerd fun…that score would top the charts. • Added-Functionitis * N/A No extra functions for this piece, but really, who cares. Regardless, it does not require the purchase of Gotta-HAVE-That cream even though…I do have to have it. • Ouch Outline * 12.4 Getting Your Finger Caught in a Door Never actually had this happen, though I came close more than a couple times. If the pain from the close calls is any indication, it must be excruciating. Still, to own this watch? I’d do it. • Mermaid Moment * Completely handmade, you say? The fact that a timepiece as amazing as this, with the level of finishing and the complexity of that dial, AND is handmade will make you want to go taste some cakes. • Awesome Total * 354 Multiply the number of skills that Smith learned by the number of months it took to create this watch. Then add the number of components that make up that amazing dial. Great score, Mr. R.W. Smith, keep at it!